The event started in a tent with seating and refreahments adjacent to the Charger. Countdown to the locomotive's bell and a shower of confetti. Michael Litschi, LOSSAN Agency, prepares to come in with a cutter. Siemens' Representatives: L to R Christoph Grimm, Paul Aichholzer, Armin Kick, technicians. Charger Locomotive includes crash management components including reinforced locomotive cab and push-back couplers. 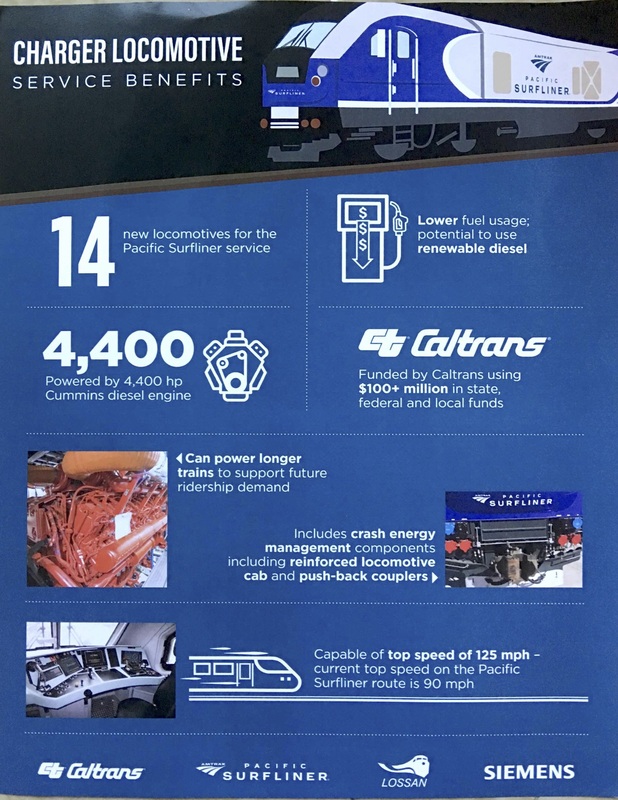 14 new Chargers to be put into service on the Pacific Surfliner. 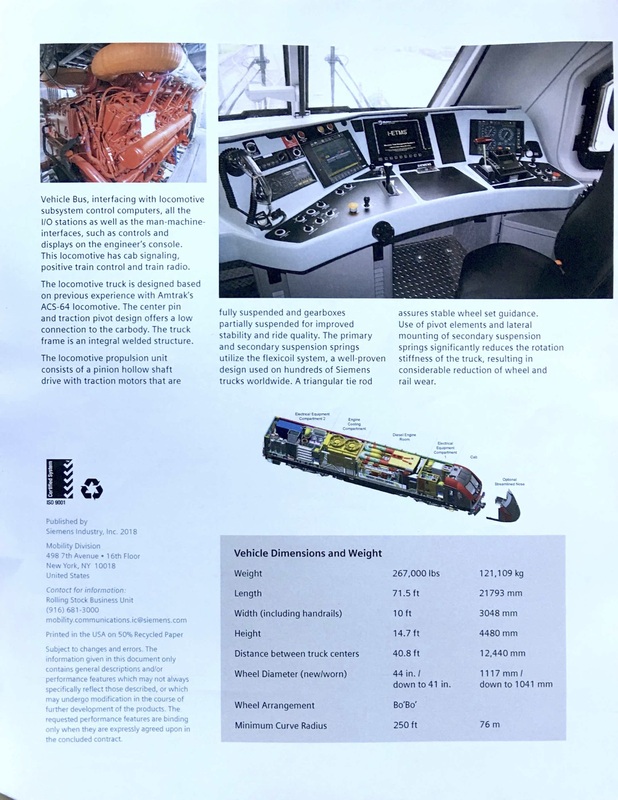 Crash energy management components including reinforced locomotive cab and push-back couplers. Christoph Grimm, Deputy Project Manager, Siemens Mobility Division, gave me a personal tour of the Charger. The left position has a screen that duplicates the operator's screen on the right. In the back of the Charger are two orange boxes (not pictured) which are the first to be recovered after a crash, similar to black boxes on an commercial aircraft. "X marks the spot" This is how I tell a Charger from an EMD, from the outside I look for the X of the Charger. I guess they will need a new banner with a Charger like this one taken on a bridge near the Del Mar Fairgrounds. Upstairs in the Business Class car, with free schedules which my station, FUL, doesn't hand out any more. Attendants area for preparing amenities of Business Class. Only one of the two doors on a Surfliner car will have the handicapped blue sign on the door. One of the two doors on a Surfliner car will have this ramp for wheelchairs and scooters. Look for the handicapped blue sign on the door that has it. I had the attendant get the ramp out and take this photo to show how it works. However, at a platform, the angle is not as severe. The ramp is only put out when needed. In my case, I just lift my scooter from the platform into the car. Once onboard the Surfliner car, nearby will be a missing seat where the scooter, or a wheelchair, can fit perfectly. 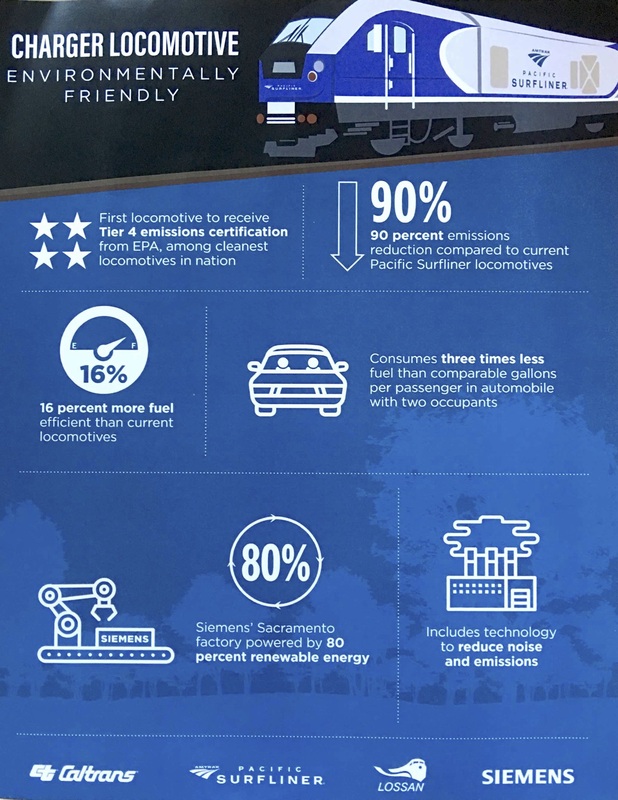 Hard to believe we have seen these F59s on the Surfliners since 1998! They are being replaced by the new Chargers which were unveiled today. 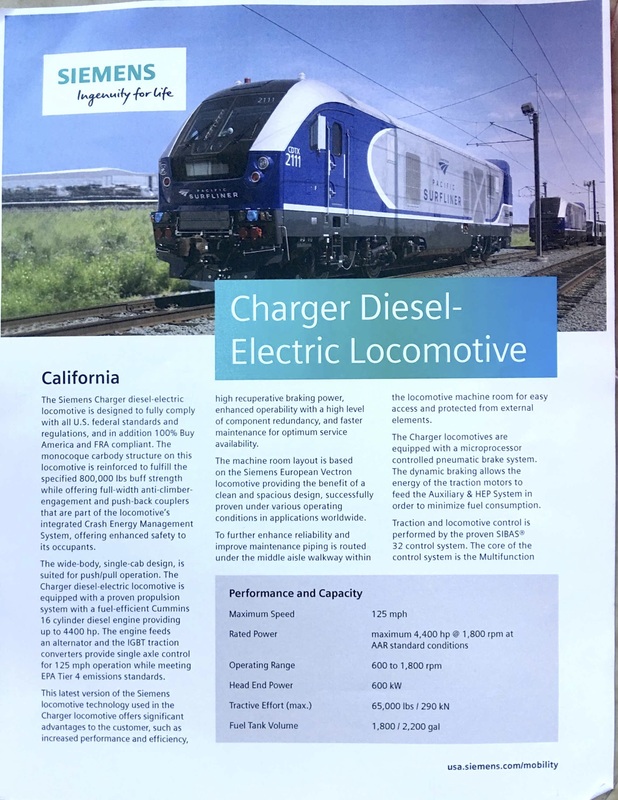 I asked Michael Litschi <mlitschi@octa.net> how many Chargers will eventually be delivered and what the fate of the existing F59 locomotives would be. There are currently 7 Charger locomotives in Los Angeles, and we expect another 7 to arrive before the end of the year, for a total of 14. Each Charger locomotive will have a “burn-in” period during which it will operate as the second unit behind another locomotive. The burn-in testing is expected to begin this month. 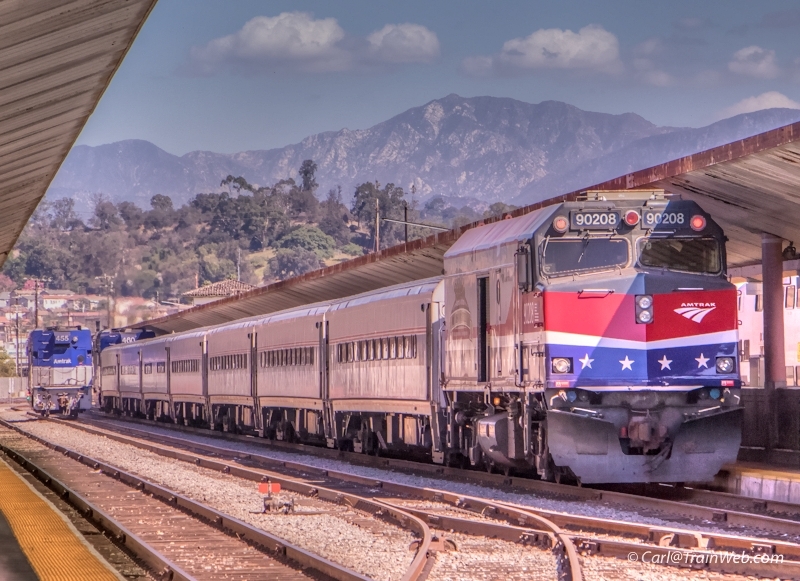 The existing Amtrak-owned F59 locomotives in the 400 series will be returned to Amtrak for use on other routes. 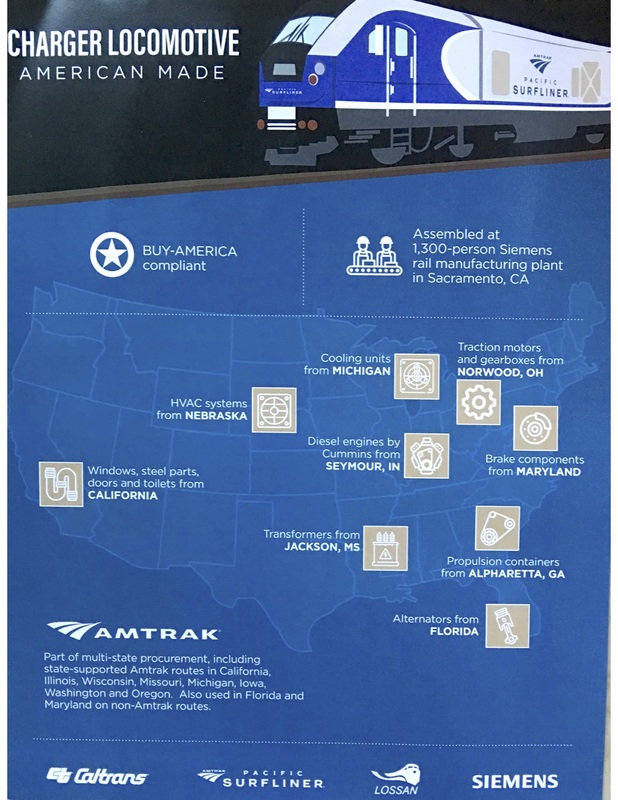 Earlier this year, Metra in Chicago announced that it is working with Amtrak to purchase up to 21 Amtrak-owned F59 locomotives. Thank you Michael for the quick and complete response. 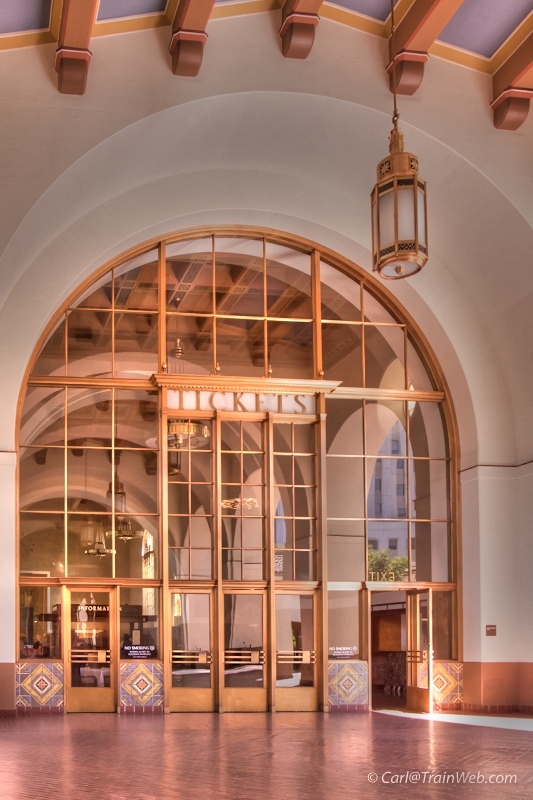 Los Angeles Union Station is a favorite place to view trains that service the area. 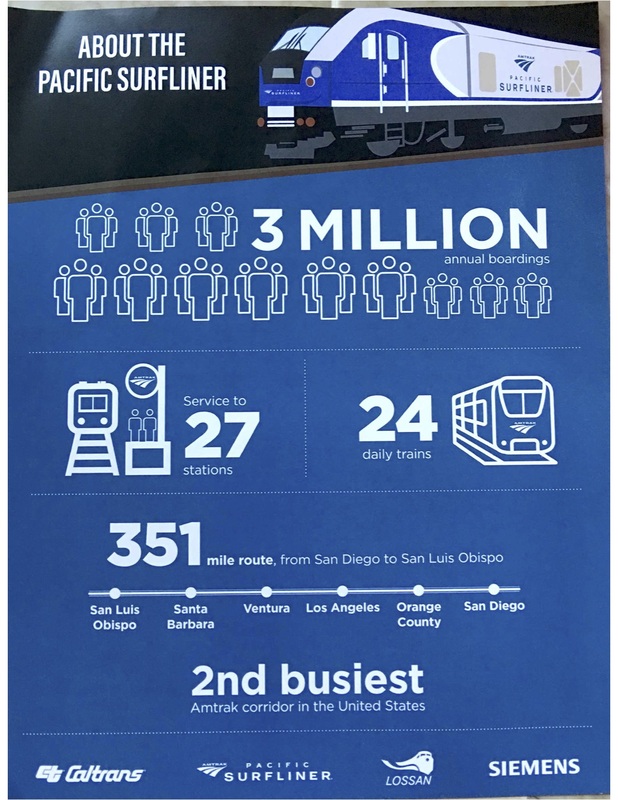 The best way to view the 14 tracks of activity is to take a train to Union Station and when you arrive, instead of hurrying into the station, walk to the south end of the stub-in tracks and look west toward the station and east toward the Metro building to see the locomotives. Your ticket is your permission to be on the platform. 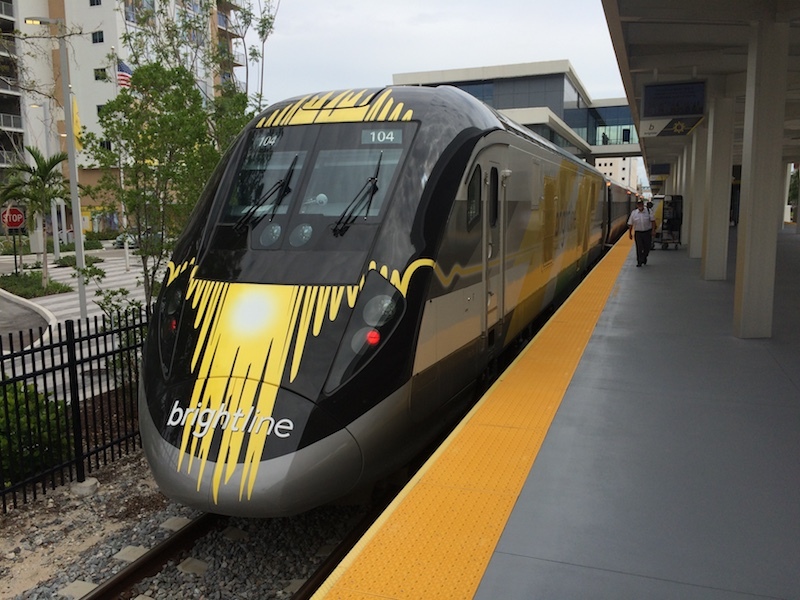 A new Metrolink No. 912 by EMD happened to be on a nearby track. New EMD next to a 17-yr-old Genesis Amtrak Long Distance Train. Metro light rail will be the nearest tracks to the station. The historic station itself provides many opportunities for photos. Directly opposite of this Ticket Entrance, two night later, was an exclusive previw of the new Imperial Western Beer Co. and The Streamliner put on by the Los Angeles Conservancy from 6 to 9 p.m.